With the enthusiasm surrounding the election of President Joko “Jokowi” Widodo, some have again speculated as to whether Indonesia will become the regional leader in Southeast Asia. That was the central question behind Joseph Chinyong Liow’s “Can Indonesia Fulfill Its Aspirations to Regional Leadership?” in which he argues that those aspirations are unlikely to be fulfilled, especially if it continues to focus on the same sort of initiatives it pursued over the last decade—initiatives that were “long on ambition but short on substance.” Unable to explain how such grand ideas would work in practice, Indonesia garnered little support from its Southeast Asian neighbors. In the future, Liow contends, such initiatives would face even higher hurdles. They would have to overcome new obstacles created by changes in the strategic environment due to the intensification of rivalries between Asia’s major powers, like China and Japan. Instead, Liow believes that Indonesia should channel its leadership ambitions in more concrete ways. He highlights successful contributions to regional stability and security when it has been engaged in “low-key, discrete efforts, including mediation, dialogue facilitation, and the exercise of its good offices.” While I concur with Liow’s pessimism regarding Indonesia’s ability to stake a claim to regional leadership through high-profile initiatives, I believe that Indonesia could emerge as a regional leader through yet another path. If Jokowi manages to implement the pledges he made during his election campaign, Indonesia would find itself with a different sort of regional heft. Among his most ambitious pledges was one to increase Indonesia’s defense spending from 0.8 percent to 1.5 percent of the country’s gross domestic product over the next five years, which would provide the resources needed for the Indonesian military to meet the requirements of its 2010 Strategic Defense Plan. The plan envisions building a “Minimum Essential Force” that consists of 180 modern combat fighter aircraft and a “Striking Force” of some 110 warships. Such military power would go a long way to helping the region balance China’s military capabilities and give Indonesia a bigger role in regional foreign and security affairs. Of course, that could prove controversial within not only the region, but also Indonesia. Many in the country’s Ministry of Foreign Affairs have traditionally not seen Indonesia in those terms. They would rather see Indonesia as a country with “a thousand friends and no enemies.” Hewing to that line, they believe Indonesia should play a modest role in regional affairs and avoid conflicts involving major powers. Domestic critics fear a new approach as merely a way to justify the promotion of international interests over national ones. Those in Indonesia’s Ministry of Defense (and surely the country’s last Coordinating Minister for Political, Legal, and Security Affairs) have always been conscious of Indonesia’s security interests at home, but they may now be growing more aware of those abroad. During the Cold War, military officers worried about the potential for internal communist unrest. Today, they worry about Islamic militants, but they have become apprehensive about Indonesia’s external security too. Along with the rest of maritime Southeast Asia, they have watched China’s actions in the South China Sea with concern, particularly as those actions have crept closer to Indonesian waters. Already we have seen daylight between the two ministries in how they responded to China’s unveiling of a new official representation of its national territory in early 2014. The new map depicted Chinese claims to the South China Sea as an extension of continental China. Many Southeast Asian observers took the new representation as a hardening of Chinese maritime claims in the region. China’s acceleration of its land reclamation activities in the Spratly Islands during the summer deepened Southeast Asian worries. Unfortunately for Indonesia, Chinese claims in the South China Sea include a sizable portion of Indonesia’s exclusive economic zone (EEZ) around the Natuna Islands, where most of the country’s offshore natural gas reserves are located. But Jokowi’s focus has always been on domestic issues. He is inexperienced in foreign affairs and may well defer to his more experienced ministers. Unfortunately, his new foreign affairs and defense ministers could scarcely be more different. Retno was a diplomat whose appointment surprised many. Although she spent her entire career within the Ministry of Foreign Affairs and was Indonesia’s ambassador to the Netherlands, she was not a political insider in Jakarta. Without direct experience with the military, it stands to reason that she has little influence within its circles. Conversely, Ryamizard is an old hand in Jakarta politics. He rose through the ranks during the rule of Suharto in the 1990s and became Indonesia’s army chief of staff between 2002 and 2005. During his tenure, he took a hard line against separatists in Aceh and Papua (for which human rights groups criticize him), but he is widely respected within the military and considered a champion for a stronger defense. If one believes that the two ministries will reflect their leaders’ outlooks, one could easily see how they might pull in different directions. For the last two decades or so, Indonesia could allow its foreign and security policies to pursue separate agendas without too much fear of consequence. Since the end of the Cold War, the United States could still guarantee the security of the region, even from afar (and if engaged in conflicts elsewhere). Indonesian foreign policy could afford to be idealistic, while its security policy focused on separatist threats from within. But now that is changing. China’s new political assertiveness and military might have pushed foreign and security policy considerations closer together throughout the region. Indonesia can no longer reasonably hope to aspire to regional leadership, if it ever could, based on vague principles alone. At this writing, there is little evidence to indicate which views (or ministries) will ultimately drive Jokowi’s foreign and security policies. Speculating on the basis of his ministers’ backgrounds, it would appear that Ryamizard, a political insider, might have an edge over Retno. Certainly, more will be known after Indonesia publishes its 2015 defense white paper. 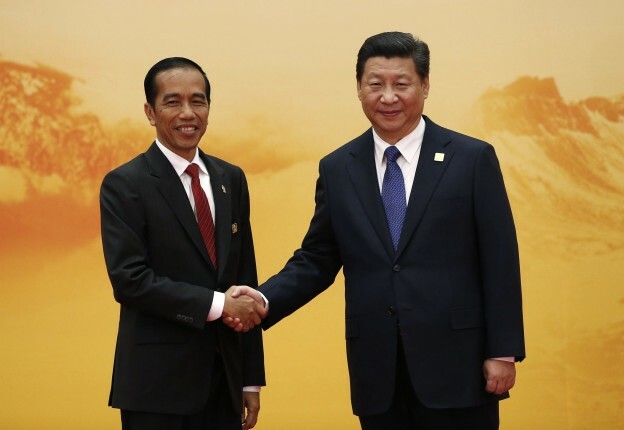 That will better define how Jokowi’s administration sees Indonesia’s place in the region. Meanwhile, there has been one clue. Indonesia’s Coordinating Minister for Political, Legal and Security Affairs, Tedjo Edy Purdijatno, recently said in his first interview that the administration still intends to sharply increase defense spending and inaugurate a new coast guard to protect the country’s maritime borders.6 That suggests Jokowi is prepared to lean further forward on defense and that Indonesia may yet have a chance to take a greater regional role. Now if only Indonesia’s legislators give him the resources to do so. 2. Similar reasoning was behind Japan’s refusal to admit that it had a territorial dispute with China over the Senkaku (Diaoyu) Islands in the East China Sea. “Indonesia pernah sampaikan keberatan atas peta Natuna,” Antaranews.com, March 19, 2014, http://www.antaranews.com/berita/424961/indonesia-pernah-sampaikan-keberatan-atas-peta-natuna. 3. Chris Blake, “Indonesian Defense Chief May Smooth Path for Army Novice Widodo,” Bloomberg, October 30, 2014, http://www.bloomberg.com/news/2014-10-30/indonesian-defense-chief-may-smooth-path-for-army-novice-widodo.html; Michael Bachelard, “Indonesia’s new President Joko Widodo announces cabinet,” Sydney Morning Herald, October 27, 2014. 4. Jon Grevatt, “China-Indonesia sign remote-sensing MoU,” Jane’s Defence Weekly, October 14, 2014; Ridzwan Rahmat, “Indonesian attack craft complete test of C-705 missile system,” Jane’s Defence Weekly, July 31, 2014. 5. Bagus Saragih, “Retno must leave behind SBY’s diplomacy, says expert,” Jakarta Post, October 27, 2014. 6. Kanupriya Kapoor and Randy Fabi, “Indonesia to create new coastguard, boost defense spending,” Reuters, November 13, 2014, http://www.reuters.com/article/2014/11/13/us-indonesia-security-idUSKCN0IX10220141113.